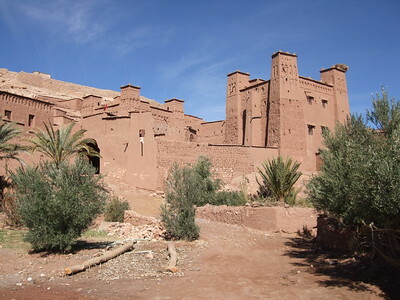 The Ksar of Aït Ben Haddou is a communal housing compound, typical of a type of construction that is traditional to the Maghreb. The buildings lie in a strategic position against a mountain. They have angle towers and are surrounded by steep defensive walls. The Ksar consists of larger and smaller private houses, but also communal areas like a market place and a mosque. All are made from moulded earth and clay brick. The walls and towers are often ornamented with decorative motifs. The age of the site is unknown. The town has been protected by the Moroccan authorities since 1953. Aït Ben Haddou is a town in Southern Morocco, about four hours drive from Marrakech and close to Ouarzazate. Getting there is half of the fun, as you'll have to cross the High Atlas mountains. The pass, called Col du Tichka, is at an altitude of 2260 metres. When I visited in December, some snow could be seen on the highest tops somewhat further away. The landscape gets more and more barren after that. There still are villages though. And women carrying fire wood and goat herds by the side of the road. I made this trip with a minibus on an organized day tour from Marrakech. This obviously has some disadvantages: we had only one hour at the site for example. 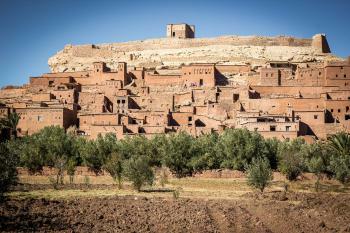 You’re let off at the small modern town of Aït Ben Haddou. From there it’s a short walk to the water crossing that divides the new and the old town. Floods in the past weeks had turned the stream almost into a river. Obviously to the joy of enterprising locals, who made good money ferrying tourists across on the backs of their donkeys and horses. They even seemed to have fixed their prices among each other – 20 dirham (1.80 EUR) a ride. The prospect of a shaky ride or the fee was enough to keep more than half of the tourists (who had arrived in the dozens) at the shore. I opted for a fat donkey (my first time!) and arrived safely at the other side without getting my feet wet. As I stood right in front of the village, it became clear to me that this Ksar really must have been built as a fortress to keep outsiders out. Its high exterior walls make you feel very small. The villagers let you in nowadays - if you pay them 10 dirham. The interior of the complex has more open air to show than the outside suggests. There are several streets, and stairs that lead you up to a view point. It doesn't appear that people still live there; there are some young guides around and several of the buildings have been turned into "art" shops. As I was put on an one hour-time limit, I had to run around quite fast. Admiring a decoration here and a view there, I couldn't help comparing this highlight of earthen architecture with the pueblos in the southern US or the similar looking sites in Timbuktu and Djenné across the Sahara in Mali. This site is well worth a visit of a couple of hours to do it full justice. A unique Moroccan WHS - there isn't really anything else like it in the country. It's interesting to observe as you approach it and see how the structures have been built against the mountain. Once you're inside, you're able to see much more detail - little bits of hay in the mud bricks, helping it stick together. Although there were some shops on the lower levels, I didn't find the touts too aggressive and it's much quieter the further you go up. I visited this WHS in June 2011. This traditional pre-Saharian habitat houses several homes crowded together within tall defensive walls near the Ounila river. It is a striking example of South Moroccan architecture. Several famous films were shot here such as Jesus of Nazareth, Kundun, The Mummy, Gladiator, etc. I visited this site on a day trip from Marrakesh. I rented a car for the day and went on the Tizi-N-Tichka Atlas pass. It lies at 2260 m, with great view on the Altlas range, before dropping in the desert. I went in January 2011 and had no trouble, but it might be closed in case of snow. The kfar is on a dirt road (easy to ride with a regular car) off the Marrakes-Ouarzazate road. Well sign-posted. There is a car park (pay the attendant as you leave) and then walk down to the river. The river is easy to cross on a cement-stoned ford, even if locals tell you to hire a camel. You can then enter the kfar from four different entrances, some with entry fees, some free. Don’t bother finding the free one, as the fee is only about 1$. Be sure to climb all the way to the top of the hill for fine views on the valley and the Atlas. 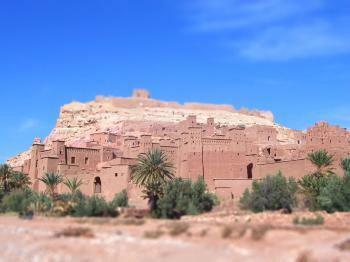 Ait ben haddou has been showed in many hollywood productions since it is a large ksar in the remote atlas mountains. sure, things are changing. And the villiages of the atlas mountains and beyond are more frequently visited and will someday succumb to modernization. there is now electricity in some parts of the atlas. and roads are emerging. but fortunately the kasbahs of morocco are still isolated from the modern world. huge flocks of goat and sheep , nomadic herders who live in tents, inhabit the atlas and its desert plains beyond. at kelaa mgouna (valley of the roses) one can hike into kasbahs that have no road access and are timeless and stunning . kasbahs, yet smaller, like ait ben haddou, dot the canyons of el kelaa. only a long day from marrakech , its worth it. For my money Ait ben Haddou should be up there with the Taj, Machu Pichu, and the Statue of Liberty as one of the worlds most icconic sites. That said I'm also glad that it isn't as being built of mud it seems rather fragile, and I sure it would soon be badly damaged, if the hordes of mass tourisum flooded in from nieghbouring Europe. Perfectly situated on a hill overlooking a fertile river valley, surrounded by desert, and with the snow capped Atlas mounrtains as a backdrop, the view from the top seems to encompase the whole world; making the ascent through the alleys of Ait-ben-Haddou, which is like rambling through the middle ages, one of life's great experinces. To sum up, pure magic. I really enjoyed my visit to this site, and it had a distinctly African feel to it, due to the mud brick architecture. The village sits on a hill on the bank of a small river flowing down from the Atlas Mountains. It was reputedly founded in 757, and was started as the home for one family and the settlement has grown out of this. The tomb of its founder Ben-Haddou is at the base of the hill behind the town. The front parts of the village are well restored, as this has been the setting of many films, from Lawrence of Arabia through to Gladiator. It has also been a testing ground for UNESCO and ICOMOS in preservation techniques. Therefore the first part of the town looks very impressive almost new, the higher up the hill you climb however the less restoration you see and this gives a good feel for what the site would be like with out the investment. It is quiet a nice climb up to the top (picture) but be prepared for a fair bit of rough ground, there is defiantly no paving here. Many of the houses are still lived in, although most now cater for tourists as sellers of local, and not so local (Malian) artefacts. On the other side of the river, is a more modern part of town, where you will find restaurants and shops still mostly mud brick architecture though. You have to cross the river by stepping-stones which is fun. We travelled out on a private day trip from Marrakesh that took in the High Atlas Mountains as well and this was a really great trip to make. On the way through the mountains saw plenty of other smaller Berber villages based on the same design as Ait Ben-Haddou, but that was defiantly the most impressive. If you were doing it via public transport the best place to come from would be Ouarzazate, which is only about 30km and apparently it is quiet easy to hire a taxi for the trip. Alternatively you can ask the bus to drop you off at the turn off from the main road and sort out some transport to take you the 7km out to Ait Ben-Haddou, though you may not want to be stranded for too long at the turn off especially in summer as there was not much shade. This was a really great day trip for us when twinned with a trip through the Atlas Mountains, well worth the visit and worth its place on the list. Built in the 17th century: Criterion (iv): "The Ksar of Ait-Ben-Haddou is an eminent example of a ksar in southern Morocco illustrating the main types of earthen constructions that may be observed dating from the 17th century"
181 Community Members have visited.